This is a story about a common Minnesota American Black Bear and a person originally from Indiana, me, who used to believe if you got this close to a Black Bear you were a goner. Obviously not true. Since I did get very close and I’m still here, my beliefs must have been incorrect. Mid September, 2015 I was dutifully taking out the compost to the base of the hill behind our home as I do on occasion. The occasion being when my wife, Betsy, tells me it’s time. She determined that 5:15 PM was about right this evening. Looking up the hill at the back, I saw a Black Bear eating green plants on the hill side not the least concerned about my approach or with my being within 30 feet. The bear just kept slowly moving forward and eating not even looking up. As I walked to the back, not knowing he was there, I wasn’t trying to be quite upon approach and was surprised when I saw him. He (I’ll explain later why I believe it to be a male.) on the other hand couldn’t have cared less about my presence. I took out my ubiquitous smart phone and started taking video. The video at the bottom of this page starts with a short segment of this cell phone video. The video below is a 9:00 minute video condensed from about 1.5 hours of video shot on this first and then a second encounter two days later. Ravens, Crows, a Bluejay along with local dogs barking can be heard in the background. If you listen carefully you can hear Honey Bees buzzing around the camera and can see the little blurs fly by during filming of the video. Two days after the encounter on the hill behind the house, the bear came in about 11:00 AM to feed on bird seed. 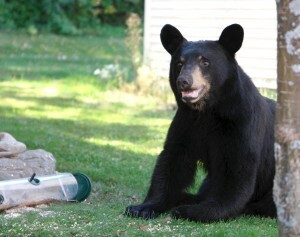 I heard a crash outside and went out to see the bear munching on a pile of bird seed he had dumped out of one feeder. I’d filled the large bird feeder cylinder the evening before, so it was full, and that is the one he took down. No damage to the feeder. He is a very gentle bear. After hearing the crash I went outside and slowly approached the bear talking softly to him as I approached. I sat down about 10’ away and began filming. About an hour later I changed positions and sat down for filming about 6’ from the bear at a different angle. After more leisurely feeding he stood up looked around and slowly walked to the other side of the backyard for a drink out of our water fountain. The fountain isn’t very sturdy, the top is loosely sitting on it’s pedestal and certainly wouldn’t hold his weight. But, he didn’t knock it over, just stood up lightly balancing with paws on the fountains edge and had a drink. He then looked up smelling another nearby bird feeder. He started to reach for it and politely got down when I told him rather firmly…NO! He then briefly and nicely posed for some photos and went back to the original feeder to partake of what he had left. Maybe the pickens weren’t good enough now. He stood up and slowly moved toward a number of other seed feeders in that same area, stood up on his hind legs and started to take down another feeder. My response was again NO and then a louder No!, and then….well, you can see the finale in the video, it’s not what I expected! A few days later he returned late at night, in the dark, and knocked over one of my neighbors bee hives. That caused a much louder crash than a bird feeder crash. When I rushed outside to see what could have made such a commotion he was gone. Even though he continued to come into the yard late at night, he didn’t touch the other bee hive. He continued to come into the yard well into November even after frosts and freezes that I thought would mean time for hibernation. I’ve been told that male bears may not den up until early December long after the females are in their dens. For that reason I’ve called this young polite beautiful Black Bear a he. Another thing I learned, the hard way, was that Black Bears WILL feed on thistle in thistle feeders. I thought taking down all the other feeders would be sufficient, but not so. We have bear teeth prints in what was a new mesh thistle feeder. And, the bear polished off about 2 lbs. of thistle. From now on ALL bird feeders will be put up early Fall on Boundary St. in Ely. Posted this with question about the bear’s wound to Ely Field Naturalist on Google Groups Dec. 12, 2015 The question, 2nd paragraph below, in bold. As all Field Naturalists know when you get close to nature the experience will change you. This encounter with a Black Bear was a peak experience for me and is now ingrained in memory. The bear was the blackest bear I’ve ever seen. Its fur was clean and luxurious; the young bear looked robustly healthy. And, he was polite and hungry. But, no matter how hungry his hunger didn’t overtake his politeness. He could have cared less that I was within 6 feet of him, but not much. He looked beyond me not at me when surveying the area while looking up from his feeding. He was feeding on the bounty of bird seed from a large freshly filled cylindrical bird feeder. He took it off the hanger without damaging it, thus part of his politeness. I filmed him for about an hour and a half and condensed that video to a 9 min. segment that can be seen at http://www.elyminnesota.com/elybuzz The remainder of his adjudged politeness was exhibited by his not destroying other bird feeders when I told him NO! Toward the end of the video as the bear starts moving to the water fountain, you can see a patch on his left mid-side that is completely bare, maybe 4-6″ wide with a deep partially healed wound. What ever encounter caused that type of wound must have been intense. Would like to know if anyone might have seen similar wounds on Black Bears and what might be the likely cause. The last time we saw a Black Bear in our backyard was about 12 or so years ago. Neighbors has seen signs of this bear’s presence a few weeks prior to this event. And, this bear continued to visit until about December 3rd. Haven’t seen him or signs of since. Your visitor surely was a handsome fellow. Bears are really cool. In spring and early summer, and even some in later summer, males complete for females and they get into fights. I handled a couple hundred black bears during 20+ years or research and males often has fresh woulds and new scars. They could really do a job on each other, sometimes. So, I suspect that your fellow had had a run in with another male, probably a bigger male, and came out with a scrape. Given the option of being killed, your fellow got out of the encounter with the other male in pretty good shape. roger . . . . . .
What a beautiful bear – and awesome video. Black Bears have an amazing power of healing, often entering winter dens with hunting wounds and emerging in the spring with wounds much less visible. Lots of black bear information available at the North American Bear Center in Ely and online at bear.org.